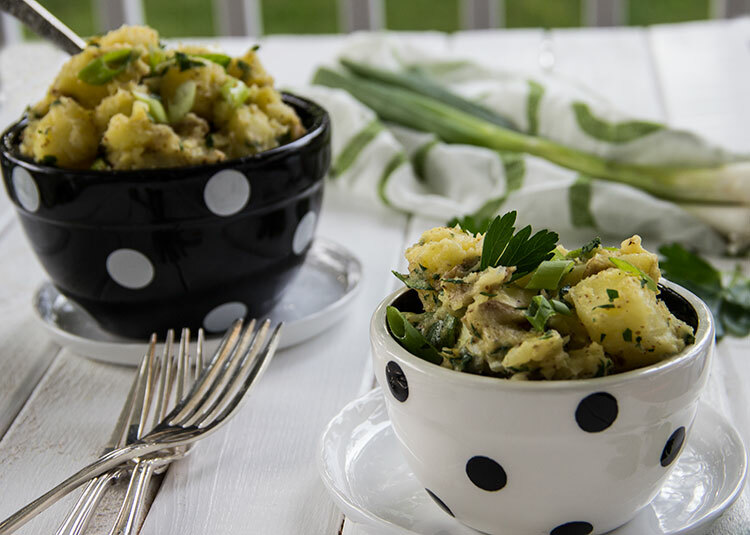 One of my favorite summer dishes since childhood has always been that ultimate picnic and barbecue side dish essential: potato salad. Tender potatoes mixed with creamy dressing and crisp veggies – what’s not to love about that deliciousness. But a traditional potato salad – served chilled with a mayo-based dressing, cooked onion, and hard-boiled eggs – is very time-consuming. So I never get around to making it very often. 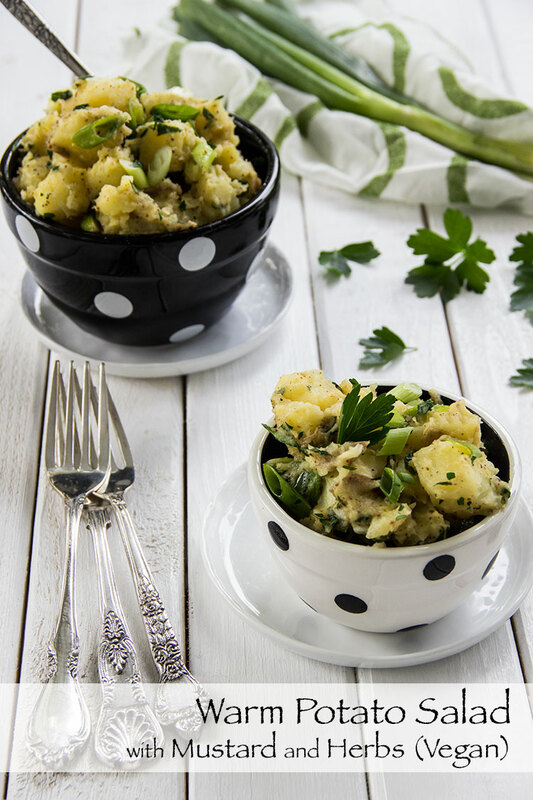 Last month, I put together this warm potato salad mixed with an olive oil-based dressing and lots of fresh herbs. 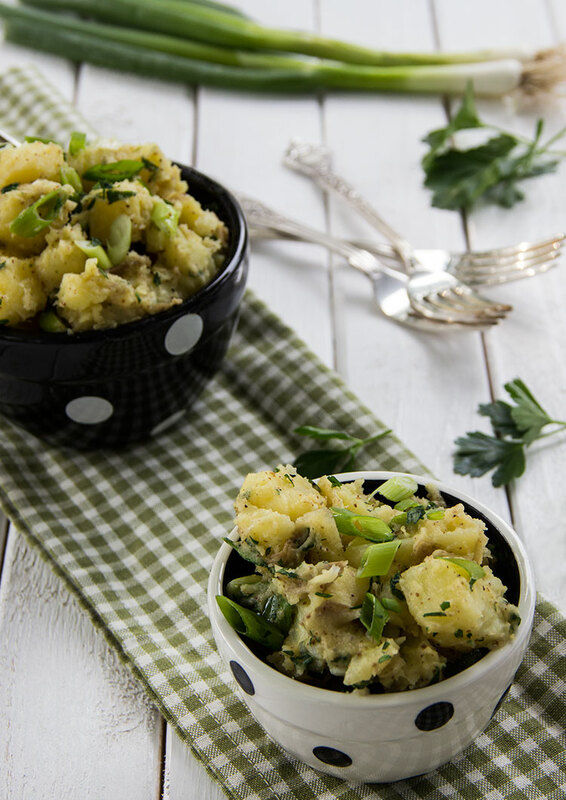 This potato salad has plenty of richness and creaminess from stone ground mustard and olive oil and tons of flavor from savory spices and lots of crisp green onions and fresh parsley. It is addictive – I’ve been serving it up weekly around my household these days. I feel good about that though because, like most vegan dishes, this potato salad is also cholesterol free and very low in saturated fat. The best part: it takes about 20 minutes to throw together! 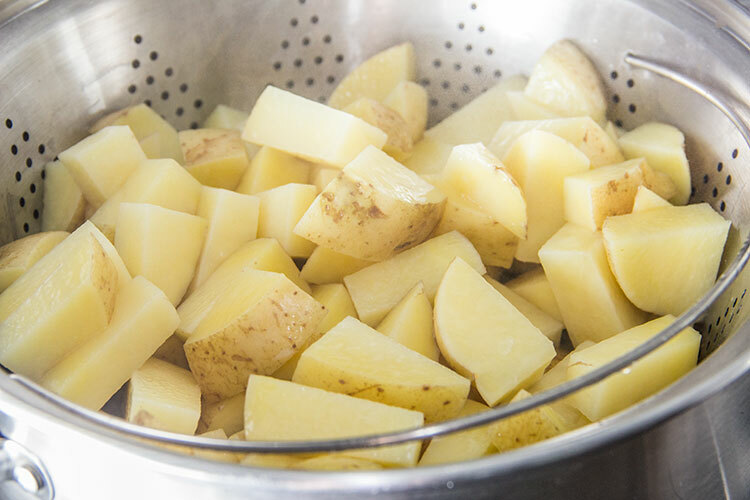 Place the chopped potatoes in a steamer basket and steam over a large pot of boiling water. Potatoes are ready when easily pierced with a fork, after about 10 minutes. While potatoes are cooking, add the olive oil, mustard, honey, garlic powder, and onion powder to a large mixing bowl. Add a pinch of salt and pepper. Whisk until well combined. 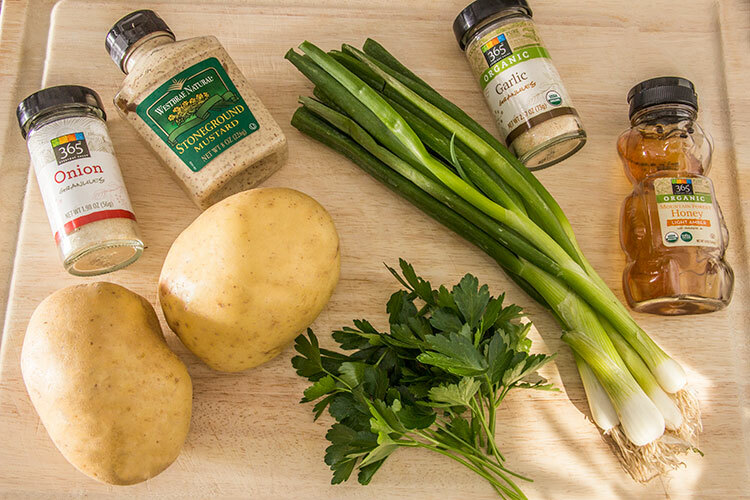 Add the warm potatoes, green onions, and parsley to the mixing bowl. Season well with salt and pepper. Stir until all potatoes are well coated with the olive oil mixture. Serve immediately while still warm. Storage: potato salad may also be served chilled. Refrigerate leftovers in a covered airtight container. Here are all of the ingredients you’ll need to get started. Begin by roughly chopping up some potatoes into large (about one inch) cubes. 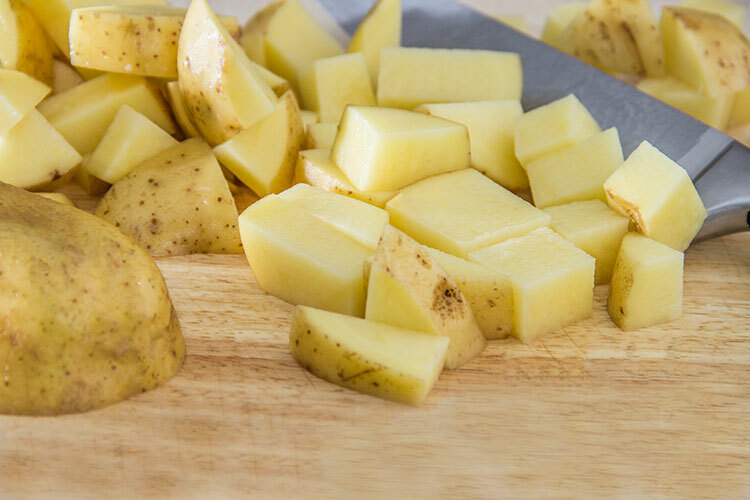 Try to keep the cubed potatoes as evenly sized as possible – – this allows the potatoes to cook evenly (so that you don’t end up with some larger pieces that are still raw while smaller pieces are overcooked). I love (and recommend) using Yukon Gold potatoes – their tender, delicate flavor is perfect for this recipe. Time-Saver: no need to peel the potatoes – lots of the nutrition lies in the skin! Place the chopped potatoes in a steamer basket and steam over a large pot of boiling water. Steaming potatoes is my favorite method, since it allows them to retain more nutrients during cooking (as opposed to boiling them, which tends to strip veggies of more nutrients). You’ll know the potatoes are ready when they’re easily pierced with a fork. 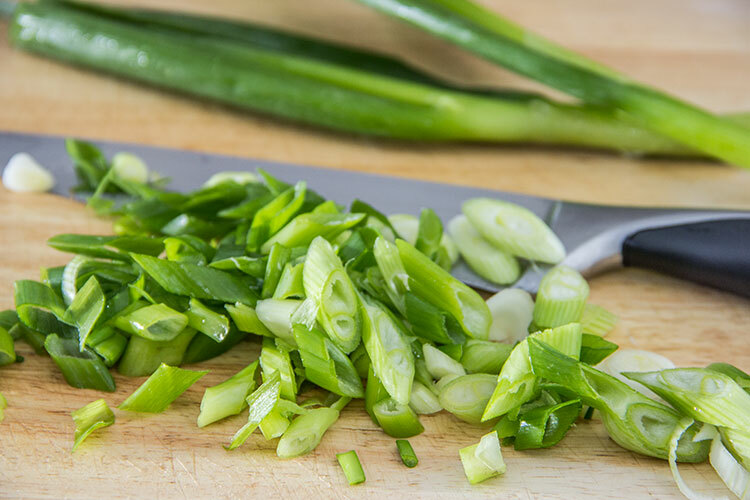 While the potatoes are cooking away, grab some green onions (scallions) and set them on your cutting board. 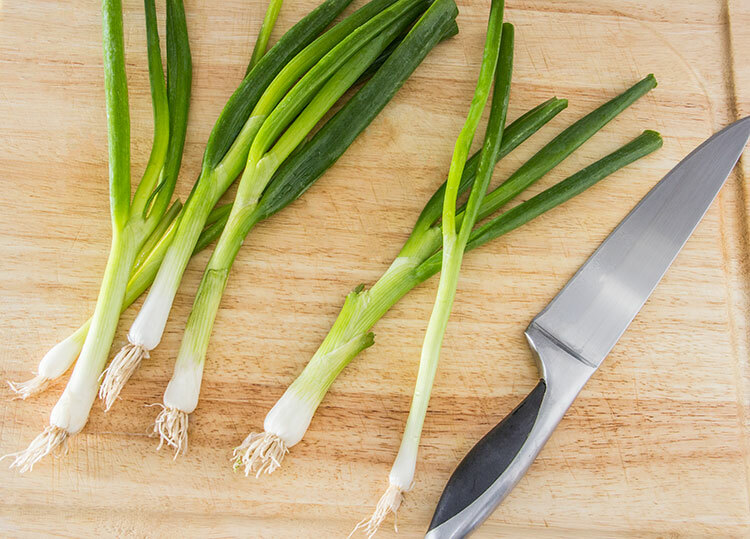 Green onions are perfect for adding a very subtle and delicate onion-y flavor to the salad, along with a fresh crispness that complements the soft, tender potatoes. Chop off both the green tips as well as the root end. Then thinly slice them up. 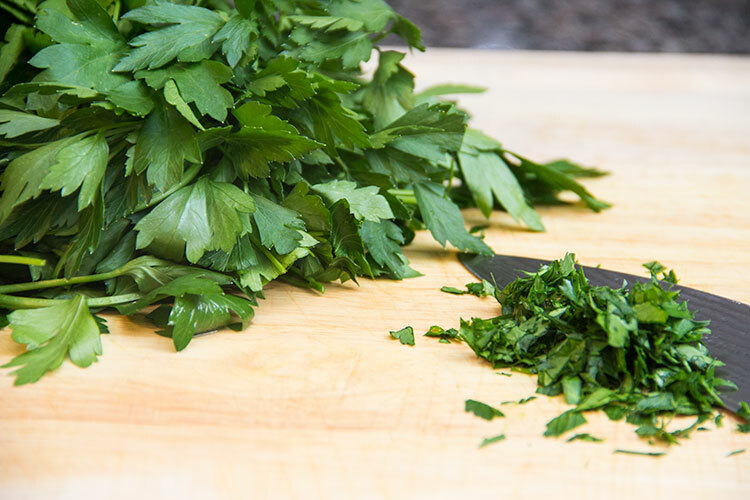 Also take a handful of fresh parsley leaves, pile them up, and run your knife through in every direction, chopping up the parsley. Then grab a mixing bowl and add some extra virgin olive oil (a good quality extra virgin olive oil is best for this recipe since it’s added at the end, after cooking, and the flavor really comes through). Also add some stone ground mustard, some honey, and a bit of garlic powder and onion powder for lots of flavor. 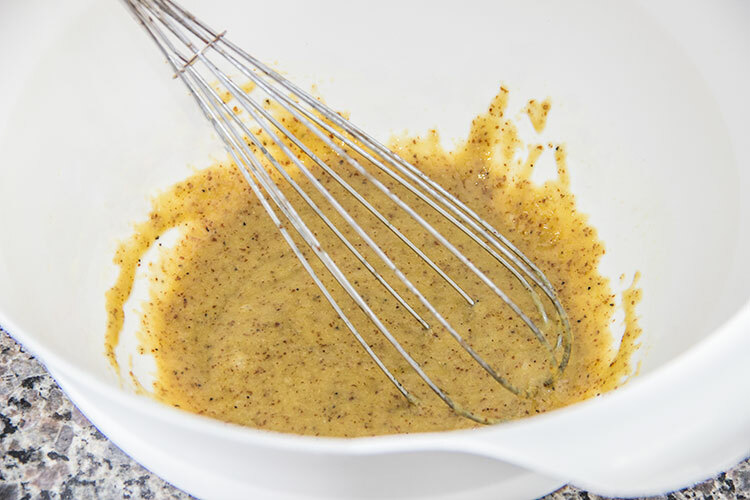 And whisk until you have a well-combined, very thick and creamy dressing. Then add the still-warm cooked potatoes, green onions, and parsley to the mixing bowl. Stir until all of the potatoes are well coated with the olive oil mixture. And season thoroughly with salt and pepper. Then serve it up immediately while the dish is still warm! The warm, tender potatoes really meld with the rich olive oil and creamy stone ground mustard to create a delicious flavor and texture. 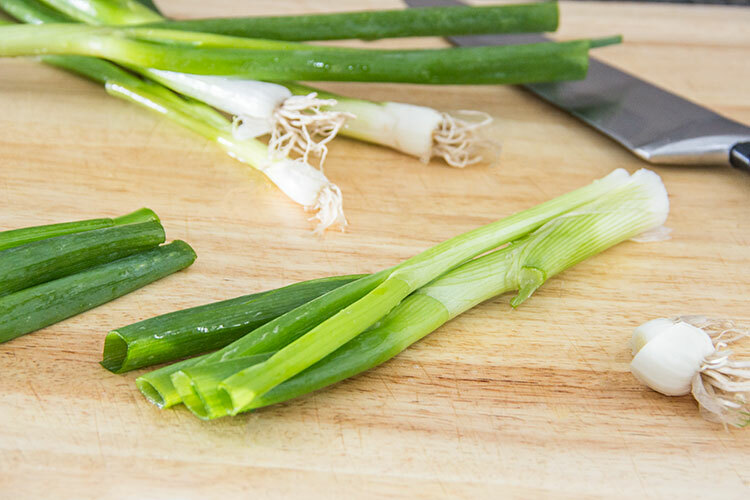 And the savory seasonings, hint of sweetness from the honey, and fresh, crisp green onions add the perfect complements. It’s deliciously tasty, it’s really healthy, it’s easy – – that’s my kind of recipe! Leftovers also taste great too, after being stored and chilled in the fridge. I am so making this for the weekend! 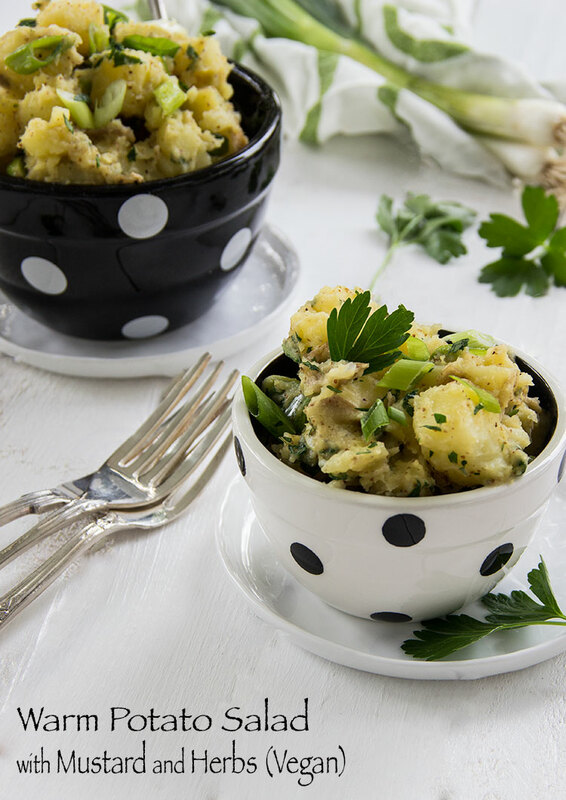 I love warm potato salad and I already have all the ingredients for this. Perfect! Since you posted this, I’ve made it three times and eaten way too much of it! I also used the dressing as a marinade for pork chops, which I grilled. It was almost as good as the potato salad! Thanks! That’s wonderful, thanks so much for your note 🙂 LOVE your idea of using it as a grilling marinade too! This is the kind of potato salad on which I was raised. Not the mayo kind. I much prefer it, and I especially love all of your herbs. Fabulous!! !